Working at the office requires a lot of discipline, too. If you’re standing in front of a computer for most of the day, you need the discipline to actually focus on the work at hand, rather than visiting your Facebook page for the tenth time this morning or watching the latest goofy YouTube video that made a sensation. In fact, chances are that if you’re reading this post, you’re probably supposed to be doing something else right now, likely something more important that you know you have to do. Something that, for all purposes and intent, really should be done, like, ASAP. But… for some reason, here you are, doing something totally unrelated to your initial task. Welcome to the fabulous world of procrastination. 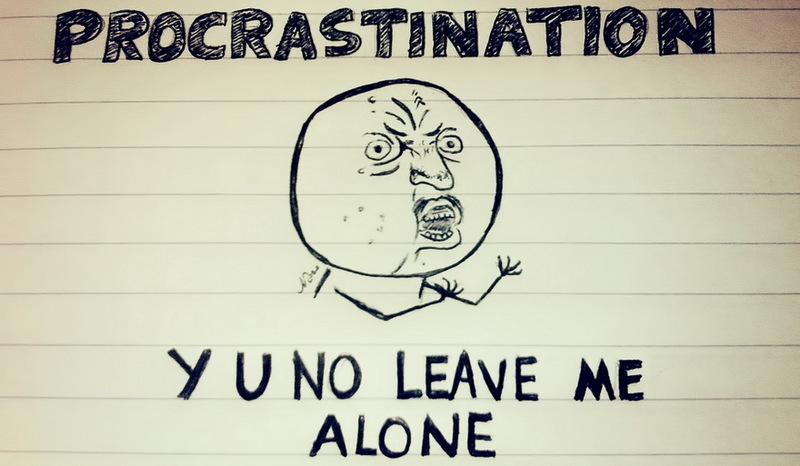 What is procrastination, and what can I do about it? Procrastination is a disease affecting pretty much every one of us, to different degrees of course, and it can be fairly debilitating when it comes to learning a new skill. Procrastination is essentially “the act of putting off essential tasks until a later time; most of the time non essential tasks are done in lieu of the more critical ones.” This is a fairly straightforward definition of procrastination, and yet the effects of procrastination are not so simple, nor trivial. Whether you want to become rich, famous, or learn to speak a foreign language, procrastination may be one of the biggest challenges you will have to overcome. Take this blog post, for example. I am actually writing this from my office, at work. I have more important stuff to do, like preparing class material, for example. Or even stuff unrelated to work that is more important than writing this blog post, such as starting my online business, learning programming and web design, or networking with popular bloggers. Yet, I’ve found a good way to nonetheless get around writing this post, because not doing what I’m supposed to be doing is infinitely easier than the other way around. Thus, by shaping the structure of the tasks that you have to do, and by ordering them in order of importance (tasks that seem most urgent and important are on top), you’ll most likely manage to do worthwhile tasks lower down on the list, because doing so allows you not to do the more important stuff you should be working on. So if learning a language is, right now, at the top of your list, I suggest that you invent yourself something more important to do. This is the end of part 1 for this post on procrastination. In part 2, we’ll examine how to focus on what matters, how to do it in less time, and how to make sure we can actually get the stuff we have in mind completed. Thanks Bob, glad you liked it! wow, thank you for pointing me to structured procrastination! I love it. It works. Haha yes, when I first came across the idea of “structuring” your procrastination, it was love at first sight! Structured procrastination is a nice idea. To a certain extent I think I’ve done it intuitively. Let me know if implementing it consciously yields some good results!